Feature-wise, there’s really not much of a difference between the many service providers jockeying for control of the streaming-music market. So when one of them does something as interesting as adding IFTTT (IF This Then That) support, you just can’t ignore it. France-based Deezer has become the first subscription-based streaming-music service to integrate with popular automation engine IFTTT. The latter allows users to set up cause-and-effect relationships between any two services through simple rules or “recipes.” In Deezer’s case, for instance, there are recipes that automatically update your various social media profiles when you favorite a track. 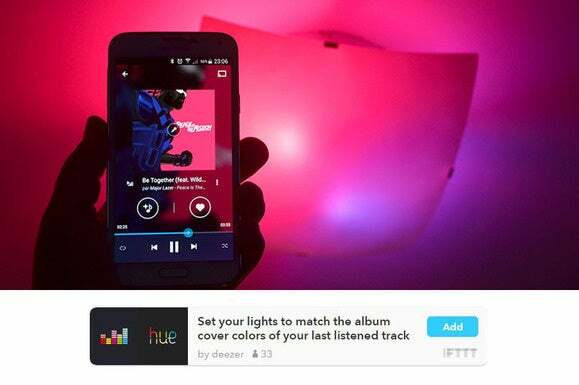 And for those who own Philips Hue color LED bulbs, there’s a recipe that dynamically syncs them with album art. Why this matters: When most people think of improvements in the context of streaming music, they generally think of personalized recommendations or higher-quality audio. That’s a somewhat cloistered view of things, considering it only looks at just a few parts of the broader experience. IFTTT support is likely to enable Deezer’s more than 16 million active users to experience the service in ways not possible before. “In the long run IFTTT may even allow us to dialog with cars and connected household electrical goods, which means that Katy Perry might just be the one to hoover your flat whilst Barry White starts the dishwasher and Adele switches the TV channels,” the French company wrote in a blog post Tuesday. Deezer offers an unlimited subscription plan that costs $10 per month, and a Sonos-only lossless streaming service that costs $15 per month. There’s also a free tier for those willing to put up with ads and a number of limitations, including lack of offline playback, lower quality than the paid versions, and a pared-down mobile experience.